The strong-running centre was capped 17 times by the Springboks between 1994 and 1999 scoring two tries. He appeared as a replacement during South Africa's historic triumph in the 1995 Rugby World Cup Final victory over New Zealand and was sent off in his final international appearance against Scotland at the next global showpiece in 1999. As a player he also represented South Africa Schools, the Junior Springboks, South Africa U20's, Free State and the Stormers. His relationship with English rugby began in 1997 when he joined London Irish for a two-year spell and he re-joined the club from Free State as player/coach in 2001. Venter was named the Overseas Player of the Season for the 2001-02 season during which he helped secure the club's first major trophy - the Powergen Cup. As a result he also shared the Director of Rugby of the Season award with Conor O'Shea. A qualified doctor, he opted to return to a full time a career in medicine in 2003 before later accepting a post with the Cape Town-based Stormers in South Africa. 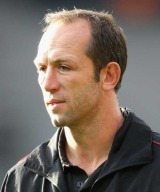 Following a significant South African investment in English club Saracens he began working as a consultant for the Premiership side before taking on the role of director of rugby following the departure of Eddie Jones in 2009. Criticism of referee David Rose saw Venter handed a suspended coaching ban in January 2010 and he was also forced to apologise to the official for his comments. There was more controversy later that season following a fracas during his side's Premiership clash with Leicester at Welford Road. He was handed a 10-week touchline ban for provocative behaviour with a further four weeks added on for the previous offence. As a result he was denied any contact with his team on the occasion of their first Premiership Final appearance where they were narrowly beaten by the Tigers. Venter ran into trouble with officials again the following season following criticism of French referee Christophe Berdos in the wake of his side's Heineken Cup loss to Leinster. European Rugby Cup issued him with a €25,000 fine (of which 15,000 euros was suspended) following which Venter refused to talk to the media. He ended his self-imposed media ban later that season with a bizarre TV interview following a Heineken Cup loss to Racing Metro. His headline-grabbing outburst came a week after he announced his decision to step back from his role and return to South Africa mid-season. The then 40-year-old, who continues to run a medical practice in Cape Town, cited "family reasons" for the surprising move but insisted he would still continue to work with Saracens in the newly-created post of Technical Director.